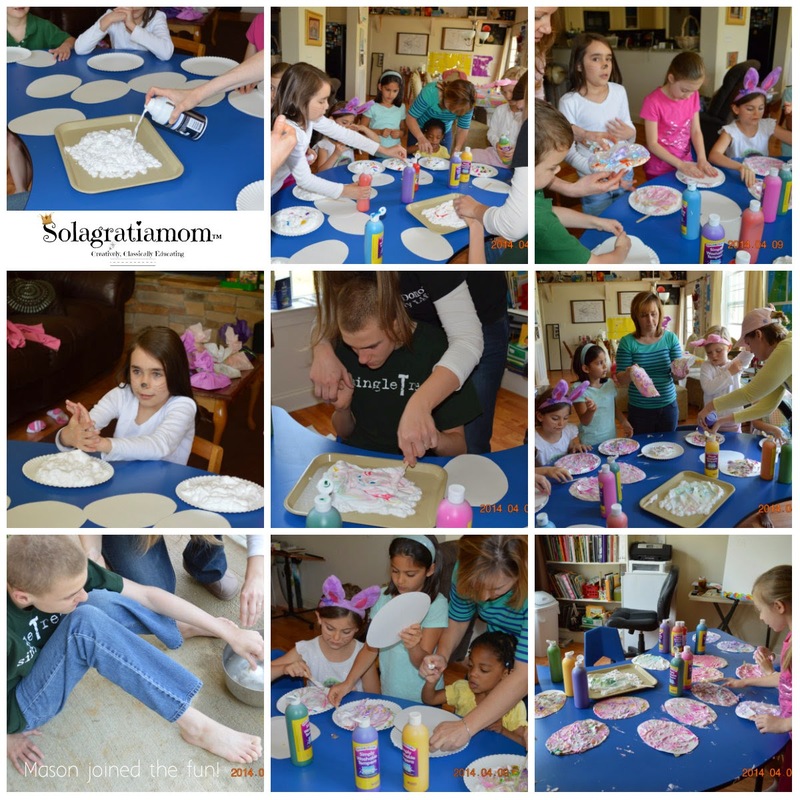 I wanted to share our end of the year blow out -Wonderful Wednesday party! I have to say that I don't think I have laughed that hard and much, in a very long time! It was so much fun! I wish everyone I knew could experience a group like this. These women and children are incredible gifts to us and one another. 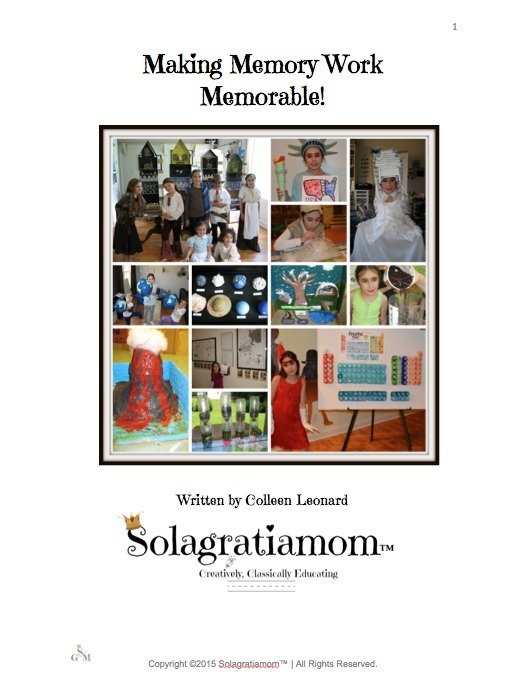 The exploration, experimentation, excitement and excellence that is within each of these kids and Mom's, is what makes life so fun homeschooling together! 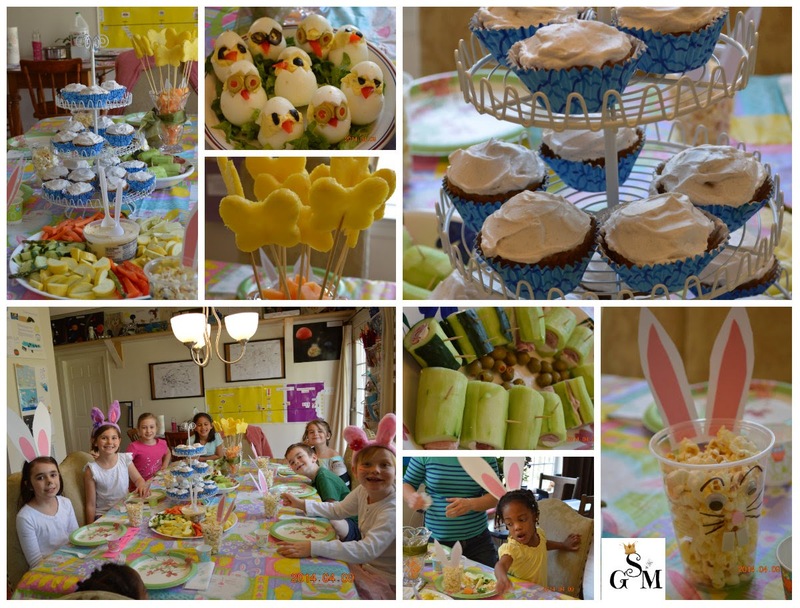 So a theme....well, I decided to go with an EGGstravaganza party! 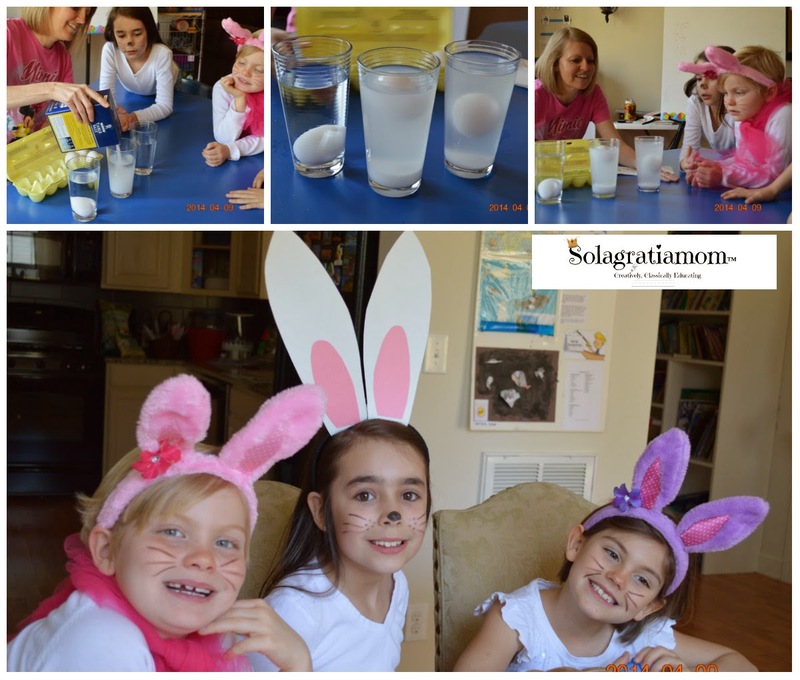 What more fitting right near Easter than lots of experiments, crafts and craziness around eggs??? To begin the egg madness, we started with learning a little about density. We took three cups of water and three raw eggs. We put one egg in plain water, one egg in heavily salted water and then the last egg in salted water but then added slowly to the side, more unsalted water. It made the third egg float in the middle of the cup between the salted and unsalted water. Pretty easy and cool. We talked about the Dead Sea and how the density of salt water causes things to float or become buoyant. Then we went on to our funniest part of the morning for us adults - learning how to peel an egg "the Russian way". 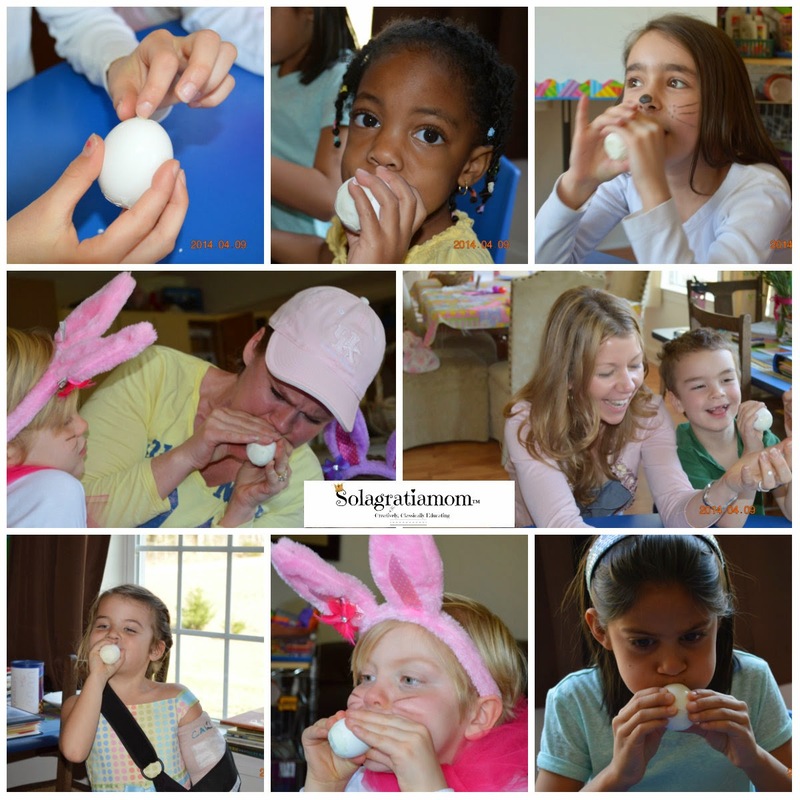 Each child got a hard boiled egg and taking it gently, they cracked the top, then cracked the bottom. Carefully, they peeled a small hole at the top and then a large hole at the bottom, the size of the egg's bottom. Next they were told to put the egg with the small hole side, up to their mouths and blow as hard as they could, to see if they could pop the egg out of the shell! This got hysterical very quickly for us adults. The kids couldn't create a seal to blow the eggs out, so we got involved trying to help them. Well, only one adult was able to do it - twice! The laughs were plentiful! There was force and mass - a little review from the year - but we were laughing to hard to point any of it out! The next thing we did was to try and get an egg in a bottle that was too small for it! This required hard boiled eggs, bottles with various sized openings, but none big enough for the egg to easily go into and some paper towels with a lighter. Each kid had a peeled hard boiled egg and a bottle. Then the adults went around and lit a piece of paper towel on fire and put it into the bottle once it burned well for a minute or two and quickly placed the hard boiled egg on the opening. The fire consumed all the oxygen in the bottle and with the egg blocking it from getting more oxygen, it created a vacuum, which then sucked the egg into the bottle! This worked for some of the bottles and not for others as well. The opening had to be big enough but not too big and the fire had to burn long enough in the bottle to make this work well. The kids enjoyed it and it was fascinating to watch. 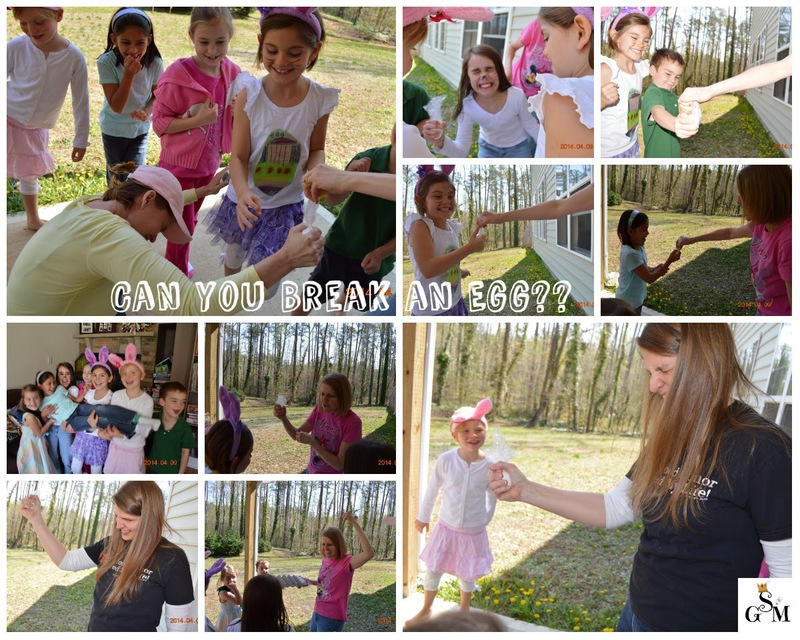 So we decided to test everyone's strength and see who if anyone, could crush an egg in their bare hand! Well, NO ONE! The kids even wanted to bring Brittney out to try (I guess they decided all us adults were wimps, comparatively). However, no one could do it....not even Ms. Brittney! This was fascinating to the kids and it led to the next "trick" which was to STAND on eggs and see if they would break! So out came my two dozen eggs and I placed each child on top of them for 10 seconds, to see if they would break. They of course, did not! So we talked about why the eggs were so strong and how we see humans build structures in this shape because of it's strength! 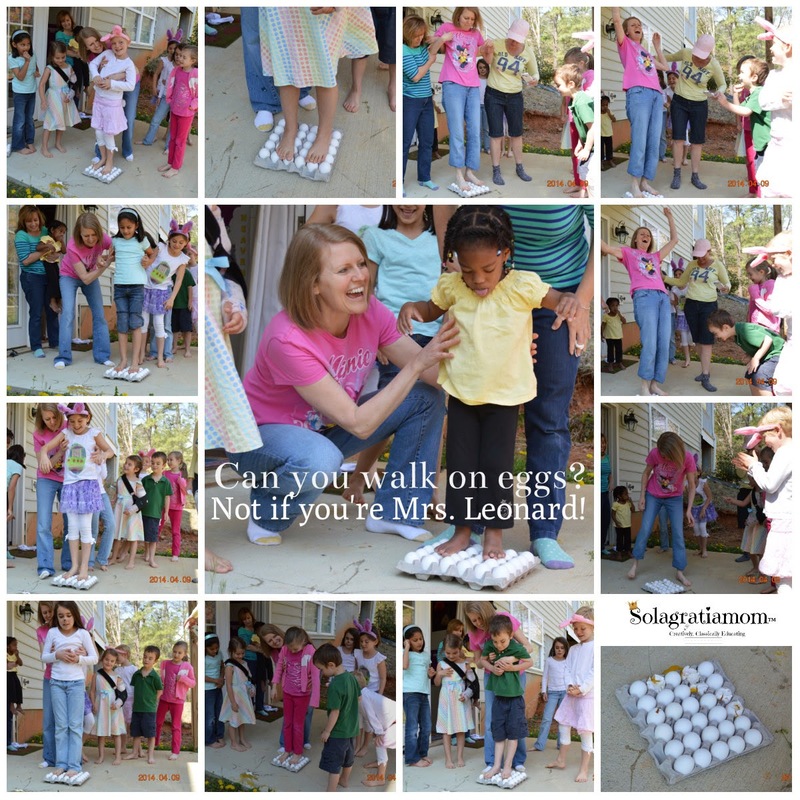 Well, that wasn't good enough because they all thought Mrs. Leonard should certainly try standing on the eggs and see if she would break them. (Perhaps they wanted to see if I need to lose weight? haha) So the ladies gently lowered me onto the eggs and then CRACK, CRACK, CRACK! I went right through them and the kids thought THAT was hysterical and I had egg all over me (wasn't the first time though -haha)! 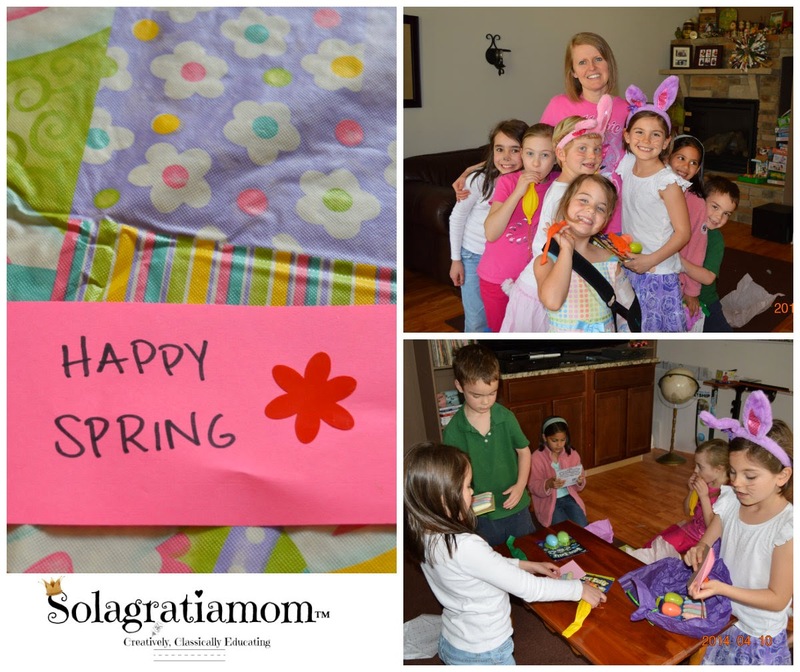 We were done outside and headed back inside to do one of the two projects I had planned for the kids. The first project, was making colored egg cards to give away. 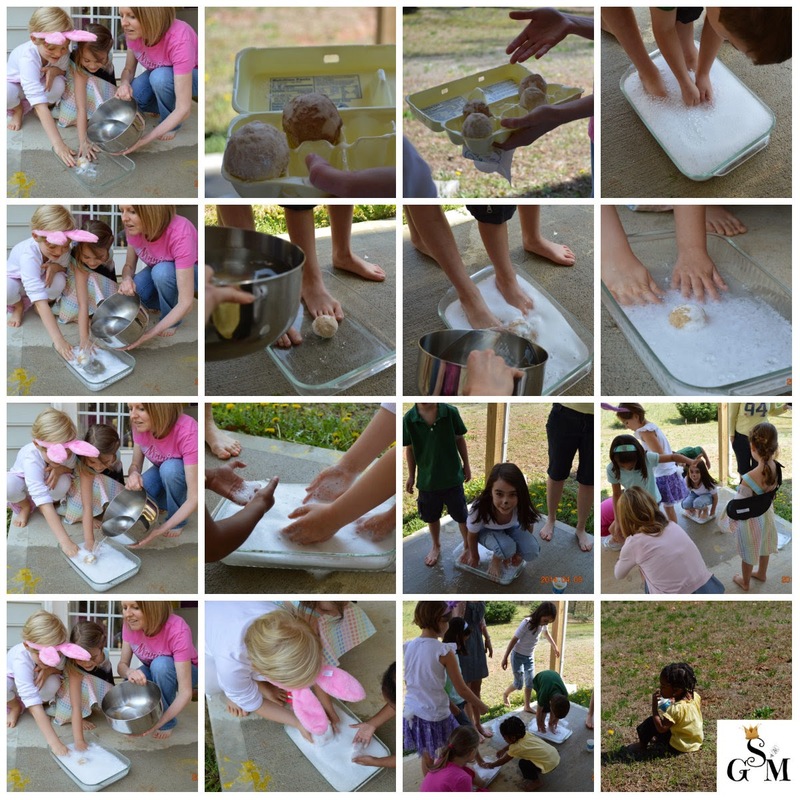 They are a great sensory activity and come out very pretty. Once they are dry, the kids can decorate them further and write on them to give to friends or relatives for the Holiday! You only need poster board, shaving cream and paint colors. Draw eggs to the size you want and cut them out of the poster board. Then take shaving cream and spread it over a plate or large dish and take various colors of paint (I used tempura paints) and squeeze small amounts of various colors, all around the shaving cream. Next you take a craft stick or knife would work, and swirl the paint colors around to make a pretty swirly design. Once the swirls are to their liking, then dip one side of the poster board eggs into it and take it out. Let it sit for a few minutes and then wipe off the excess. You have a pretty egg to give away! The final craft, before we enjoyed all of our Easter treats that everyone brought, was to make a Jesus craft for the Easter season. I took a cardboard box and cut squares about 10"x10" and then took 4 small tiles (like a backsplash would be made from) and some paints with a glue gun. The kids painted the cardboard background a color and then each of the tiles were painted a color to match the poem I had written. The tile and the poem were hot glued onto the cardboard. Once the final craft was done, we headed to the table to eat all the yummy's that the Moms had made and I had a few goodies for the kids to end the Wonderful Wednesday year! It was a terrific year of Wonderful Wednesday's and I'm already writing next year's plan for Cycle 3 and hoping to release that for sale in May! I love these kids and the Moms, it is a tremendous blessing and humbling to be able to do this with them each week during our CC year. God is good! I hope you have a Happy Spring and stay tuned for this summer! If you liked what you saw in Cycle 2 for Wonderful Wednesdays, then take a look back at what we did for Cycle 1 the year before! You can peruse through the past two years of activities and ideas and create your own fun for this summer! 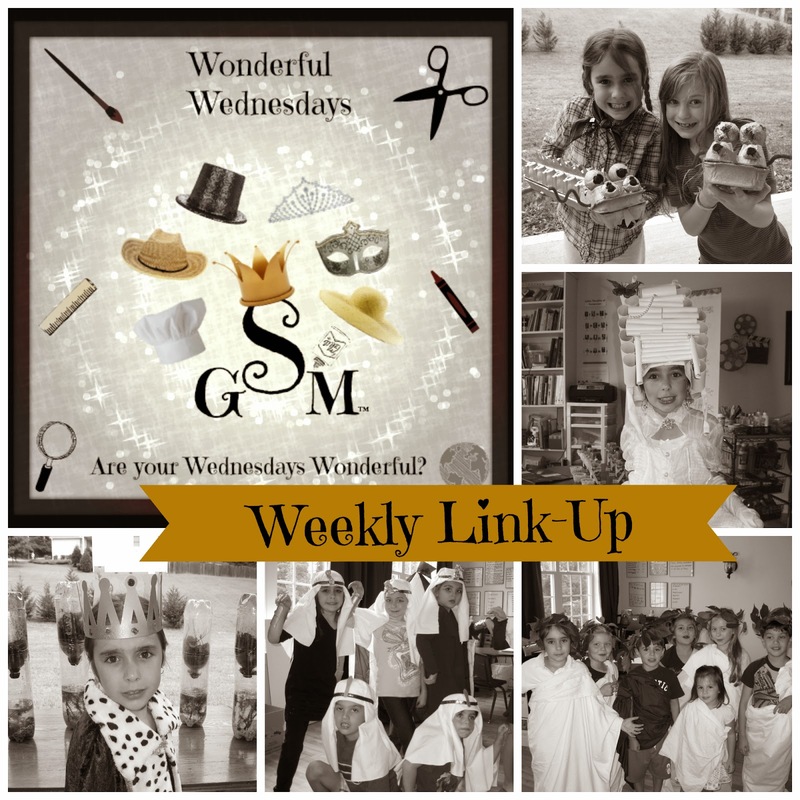 If you have been doing a Wonderful Wednesday where you live, then I would love to see you link-up at Wonderful Wednesday's Link-Up! You are SO MUCH FUN! I'm looking at these photos thinking how blessed all of these children are to have this opportunity to be homeschooled and learn so much in such a fun way. I love all of the ideas! Thanks for linking with Collage Friday! What a wonderful learning party! You always come up with the most exciting projects and activities! I love your activities! What a wonderful group! What a great way to end the year! 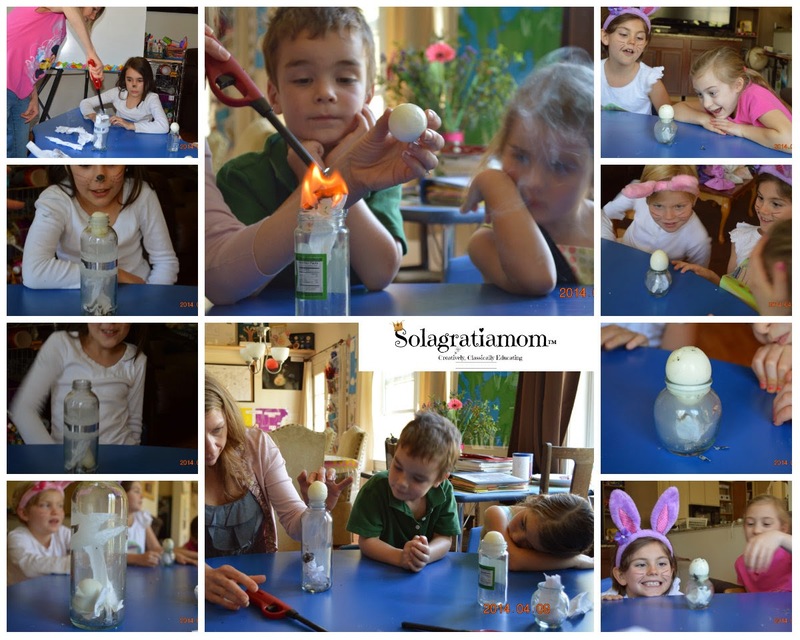 We did a lot of these egg activities in a co-op a year or so ago and they were a lot of fun =) Thanks for sharing! What a tremendous amount of fun!! So many great ideas - thank you so much for sharing! Looks like you had a great amount of fun. Someday I want to try the whole walking on eggs thing, but I haven't been brave enough yet to try it. I love so many of these ideas! We actually did the egg floating in the salt water at our junior church last Sunday, but I love the idea of a whole egg party! E-BOOK DOWNLOAD - Only $1.00! Visit Sola's profile on Pinterest. Solagratiamom© is independent of Classical Conversations® and is not supervised, approved, authorized or endorsed by Classical Conversations®. The materials offered on this site are intended to compliment and/or expand upon the curriculum offered by Classical Conversations®. You can visit www.classicalconversations.com for more information concerning their program and materials. ©2012 Colleen Leonard. Picture Window theme. Theme images by Airyelf. Powered by Blogger.